A shepherd plays the pan flute in HERCULES (1958). This is the very first image from the film. Yesterday, I made a video montage of maidens or Ladies-in-Waiting from PEPLUM master Pietro Francisci's films. Every day of this week I'll post some fun aspects of his films that many might not know. Today, 3 of his films start with shepherds or fisherman and pan flutes. All of his films should have started this way. In SIEGE OF SYRACUSE, at the very start of the film we see a shepherd disturbed by the two soldiers on horseback. The shepherd is not playing a pan flute but it's probably in his pocket. 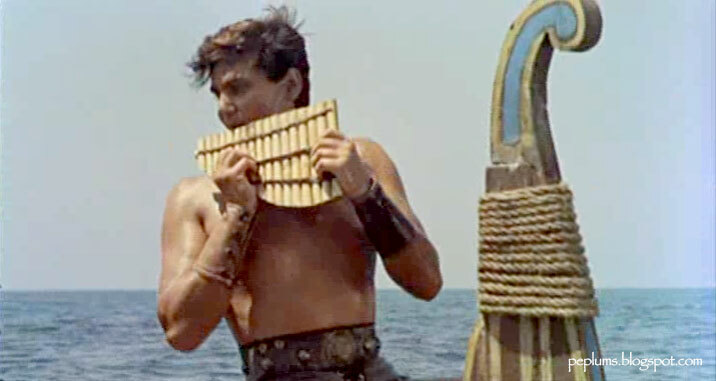 Again, the very first image in HERCULES, SAMSON & ULYSSES is Mario Novelli playing the pan flute. He's not a shepherd but a fisherman (or shepherds of the sea). The entire beginning was removed for the US version but this is how the film was intended to start in Francisci's original Italian cut. 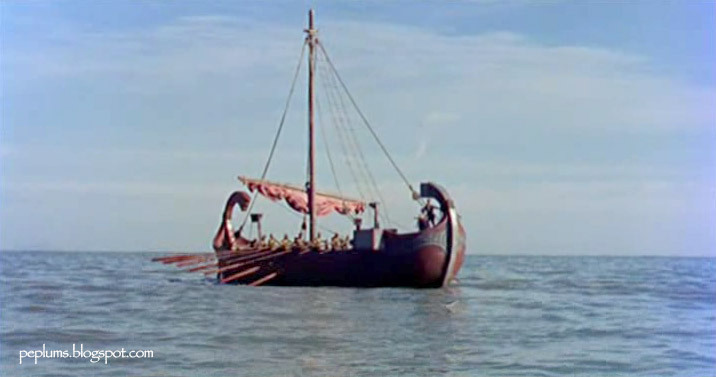 Continuing with the special details found in the films of Pietro Francisci, one of the first thing that popped out from his films was his adoration of filming long dialogue filled scenes which take place on a moving chariot or covered wagon. 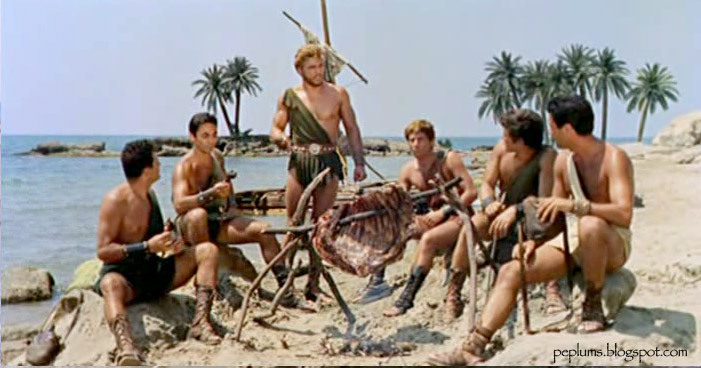 No other PEPLUM director created elaborate scenes like these. 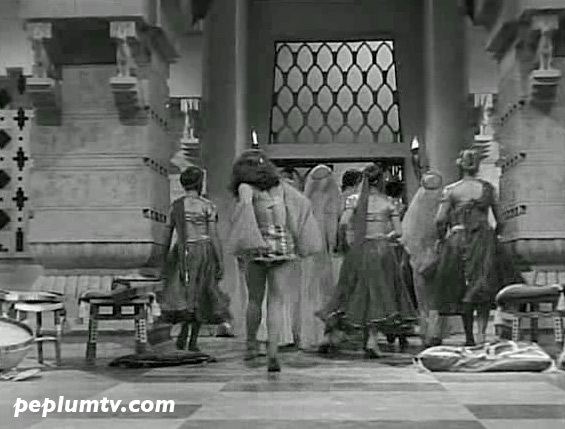 These scenes are very tricky: mostly filmed in studios, the illusion of movement and the outdoors have to be recreated but most directors wouldn't bother with all the trouble except for Francisci who obviously loved the theatricality or quaint aspects of such scenes and he had one in all of his PEPLUM films. It's uniquely Francisci, whom I believed looked at these as some sort of fetish. I love watching these scenes. 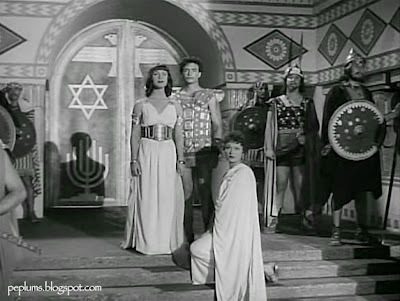 From THE QUEEN OF SHEBA: Prince Rehoboam (Gino Leurini) tries to seduce Balkis (Leonora Ruffo) as they both ride on a chariot towards her Kingdom. Beautiful scene. Very dreamy. 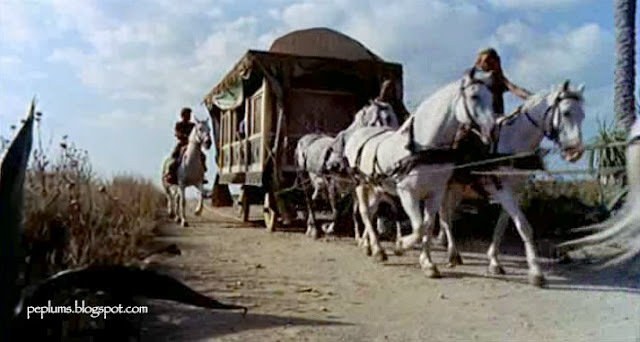 Sophia Loren rides a horse-drawn wagon in ATTILA; probably the shortest scene of the bunch but it's still present. Lotsa eh jewellery jiggling. From ROLAND THE MIGHTY: Aude (Lorella De Luca) rides a covered wagon with a man playing a lute for her. In the background we see soldiers on horseback following the wagon. 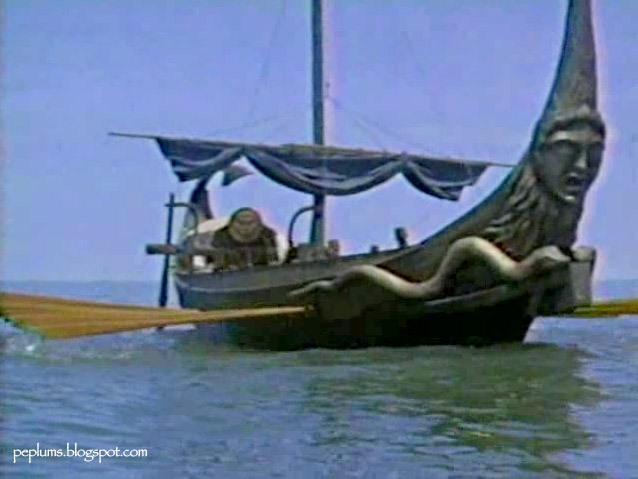 From HERCULES (1958). 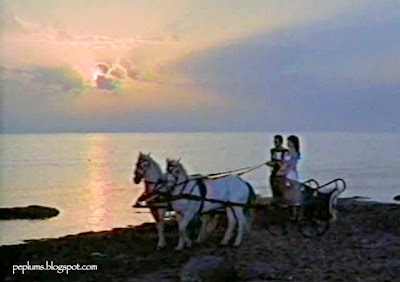 One of the few scenes actually shot outside: Hercules (Steve Reeves) and Iole (Sylva Koscina) fall madly in love during this chariot ride. Probably the most famous of such scenes from a Pietro Francisci film: Hercules (Reeves) is teased by Iole (Koscina) and Ulysses (Gabriele Antonini) in HERCULES UNCHAINED. Classic scene, which lasts several minutes. Iole (Koscina) sings Evening Star from HERCULES UNCHAINED. Ulysses (Antonini) enjoys the melody. Nice scene. Again, there's a dreamy quality to it. 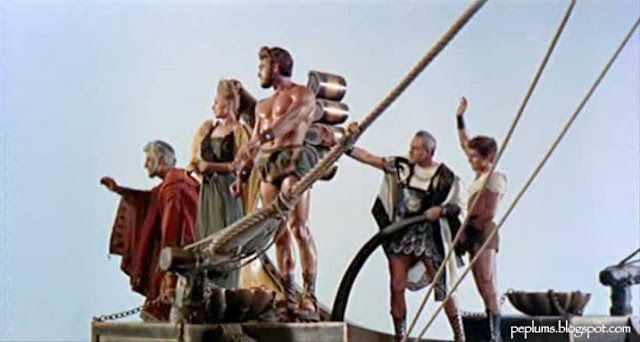 One of the few scenes not filmed in a studio: Castor (Willy Colombini), Laertes (Andrea Fantasia) and Pollux (Fulvio Carrara) ride a fast chariot as they gather all the men to rescue Hercules in HERCULES UNCHAINED. 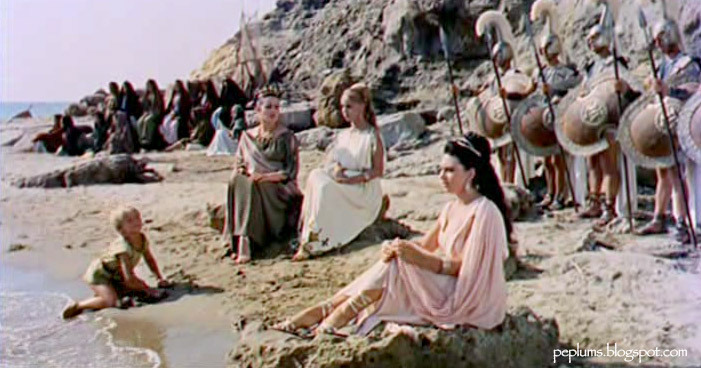 Gorgia (Enrico Maria Salerno) tries to convince Diana (Tina Louise) of his lust love for her in SIEGE OF SYRACUSE. This scene lasts several minutes. I love it. 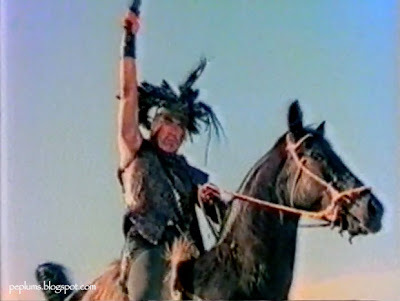 Screenshot from SIEGE OF SYRACUSE. A brief scene of Archimedes (Rossano Brazzi) riding a chariot with Tiresias (Walter Grant). Instead of trees moving in the background, we see leaves flowing around them to create the illusion of movement. Tina Louise, as Sappho, whips her horses during a chariot race. Love this scene. From SAPPHO - VENUS OF LESBOS. Above & below: And last, but not least, in what's probably the most over-the-top wagon/chariot sequence from any Francisci film, Hercules (Kirk Morris) and Delilah (Liana Orfei) have a nice little chit chat while they're moving along towards action. The maidens in the back are cooking or playing music. Talk about luxury. From HERCULES, SAMSON & ULYSSES. This scene is from HERCULES UNCHAINED. It's a beautiful moment. If it doesn't ring a bell it's probably because it has been cut from most versions out there: Penelope listens to a sea shell, waiting for Ulysses' return. While some might say that the scene doesn't add anything important to the story imo it shouldn't have been cut since it's sweet and a typical Francisci touch. Ships, ships, ships! 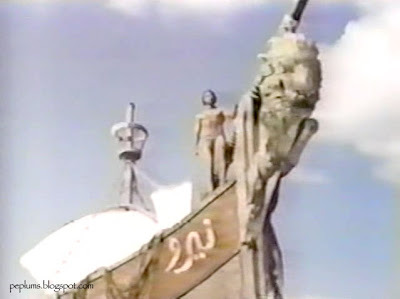 Pietro Francisci's films almost always had a ship or two or a bunch in them. Most were models and were beautifully rendered. 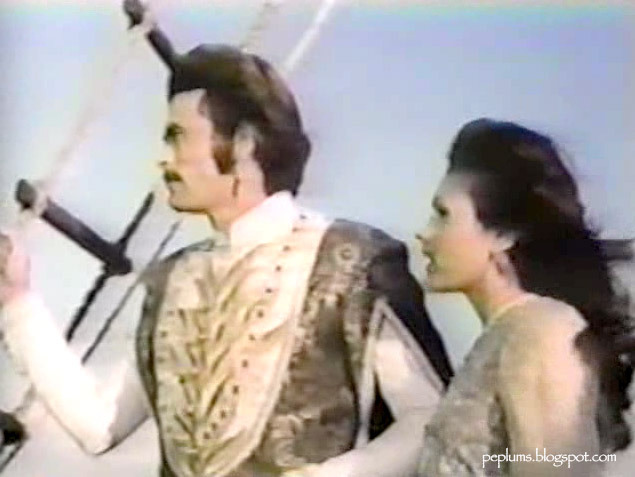 PEPLUM films being a close cousin to Swashbucklers, it's not surprising that they're often featured with sea-faring heroes like Jason or Sinbad. To end the week long visual summary of Pietro Francisci's work here are all the closing shots from his films, in no particular order. I'll create a permanent page for all the posts from the past week.